One more post on weight loss (or gain), mitochondria density, and metabolic health and then I’ll get back to posting some healthy, gluten-free recipes. I promise. But before I do that, I have to fill in the blanks from my prior post on this subject. To catch up, please see part one—the mitochondria: your own starship enterprise. This two-part series features highlights from last June’s Fitness & Health Bloggers Conference held at the newly opened Anschutz Health & Wellness Center. Okay, are you ready for a different take on weight loss? Curious, even? Dr. Iñigo San Millán is the director of the Human Performance Lab at the Anschutz Center. He’s an exercise physiologist and his conference presentation brought together two different areas of customized approaches to fitness. On one end, we have the average person trying to lose weight and get healthy. 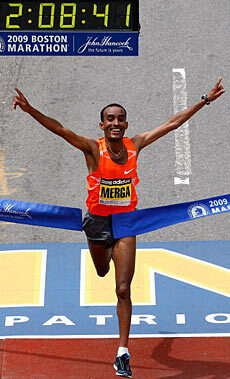 On the other end, we have world-class, elite, endurance athletes. You know—the kind of people who run ultra-marathons, break world records, win Olympic medals, ride in the Tour de France. Yes, I know, there’s a big gap between average and elite. But according to Dr. San Millán, we have a lot to learn from elite athletes and can apply the same general principles of metabolic health to our own pursuit of fitness. What is metabolic health, you ask? Overall, it means being healthy and fit in all aspects and on a whole body level (on a cardiovascular, hormonal, emotional, nutritional, and cellular level). Sounds rather yogic, doesn’t it? Mind, body, and spirit health. Dr. San Millán tossed out some brutal facts about the rising rates of obesity, diabetes, cancer, and cardiovascular disease in the United States. Sixty-eight to seventy percent of the US population is overweight or obese. Two-thirds of Americans are on some sort of diet or weight-loss program at any given time, but 98% of weight loss is gained back. That roller-coaster ride of weight gain, weight loss, weight gain undermines metabolic health and makes it increasingly harder to lose the weight. What’s the answer? It’s complicated and there’s no magic formula, but there’s a positive side to this. We can make health-enhancing changes at anytime of life. It’s never too late to eat better and move more. BUT, it has to become a way of life, not a temporary “diet” or periodic exercise program. So, what makes these elite athletes metabolic super-stars? High mitochondrial density and metabolic flexibility. In a nutshell: cellular energy requirements control how many mitochondria we have (in “healthy” individuals without a genetic mitochondrial disorder). 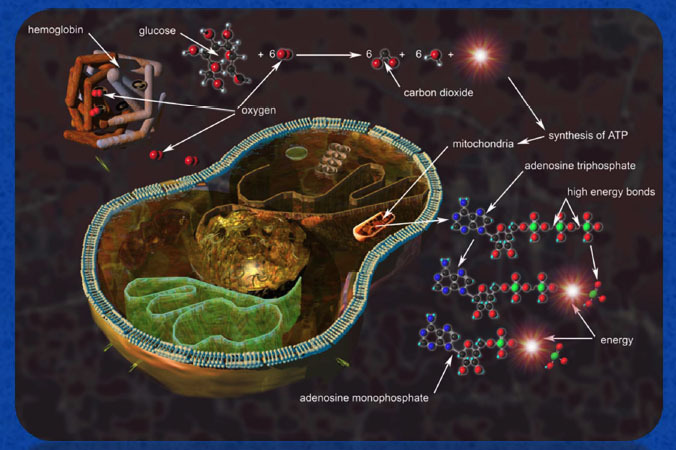 The more we move (walk, run, hike, bike, ski, play tennis), the more mitochondria we have. Endurance athletes have twice the mitochondrial content as sedentary individuals (Davis et al., 1981, 1982). The more mitochondria we have, the more efficiently we process carbs and fat. The more efficiently we process carbs and fat, the less likely we are to be overweight. If we maintain a healthy weight, there is less risk of insulin resistance, diabetes, and heart disease. See those legs in the above cycling photo? That’s turbo-charged mitochondrial density in action. It’s unlikely any of those cyclists are overweight or have type 2 diabetes or heart disease. 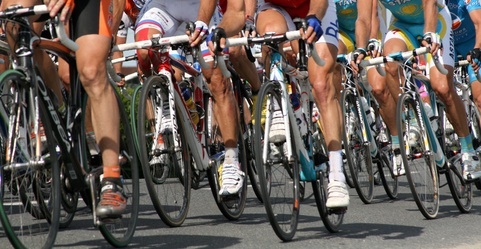 Tour de France riders consume an average of 6000–9000 calories per day. Of those, 75–80% are carbs. Michael Phelps told ESPN that he consumes 8000–10000 calories per day during training and competition. Again, a high percentage are carbs. Okay, sounds good, but where do we start? And comparing ourselves to elite athletes is a little intimidating, wouldn’t you agree? 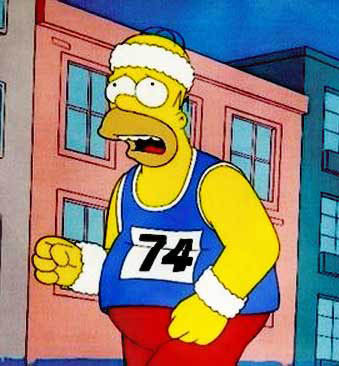 I don’t know about you, but I’m not going to be running marathons anytime soon. Plus, we’re all different. Each body is unique. We have different adaptations to exercise and different responses to what we eat. But, the good news is, it doesn’t matter how old we are or what shape we’re in, we can make positive changes. We can lose weight. We can eat better. We can become healthier. We can increase our mitochondria and enhance our ability to process carbs and fat. We can thrive. Here’s the deal. According to Dr. San Millán, physical activity should be the foundation, boosted by a healthy diet. And that healthy diet can include carbs. Healthy carbs aren’t evil, we just need to move our bodies daily to be efficient at processing those carbs. I agree. We need to make time for activity, at least an hour a day, more if possible. You don’t have to go to the gym or buy expensive equipment. Dance, do yoga, garden, walk your dog, sell your car, move to Paris, become Amish. It’s about permanent lifestyle changes; it’s not about dieting. We need to move more to lose weight, maintain metabolic health, and avoid type 2 diabetes and heart disease. We don’t have to be an elite athlete, but we can learn from them. Peace, love, and physical activity! Lots of it. Weight loss will be the side effect! This is good information, especially if you want to lose weight, maintain a healthy weight, avoid type 2 diabetes (maybe even reverse it), boost your energy, and generally enhance your health and vitality. Seriously, if nothing else, who doesn’t want more energy? This will be a 2-part blog post. I have too much information to share with you in one shot. Last June I attended the Fitness & Health Blogger’s Conference at the new (and amazing) Anschutz Health & Wellness Center on the University of Colorado’s Medical School campus here in Denver. The conference, put on by the awesome folks at Zephyr Adventures, included everything from world-class speakers and organic food to optional exercise classes in a state-of-the-art fitness center. We were also treated to a tour of the metabolic kitchen and dinner on the urban garden green roof. For someone with a background in exercise science and nutrition, this was my kind of conference. Plus, we got to wear workout clothes the whole time. It makes it much easier to squirm around and sit cross-legged in a lecture hall if you’re barefoot and wearing yoga pants. Dr. James Hill is the founder and Executive Director of the Health and Wellness Center. He’s also the co-founder of the National Weight Control Registry and America on the Move, a national weight-gain prevention initiative. He kicked off the conference with a presentation on The Importance of Evidence Based Approaches to Health and Wellness. The audience, mostly fitness bloggers, loved him. He’s a leading expert on obesity, food policy, environmental changes, genetic influences on energy balance, the health consequences of inactivity, and on and on and on. The guy is brilliant and has a great sense of humor. Perfect combo! 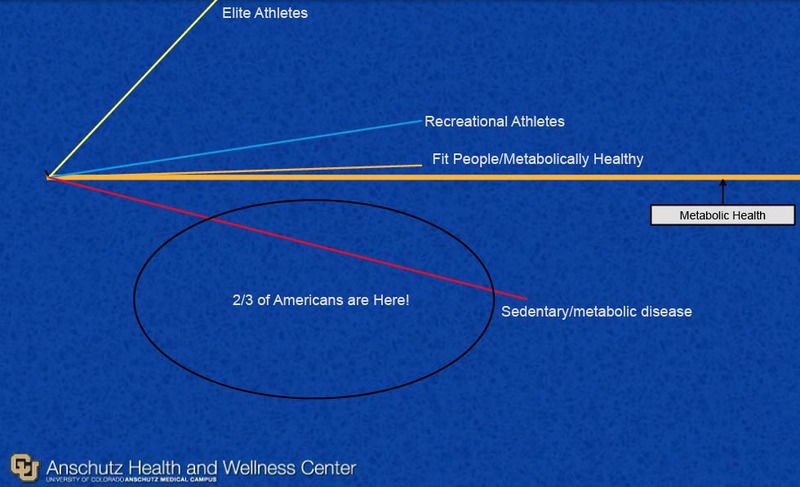 One of Dr. Hill’s slides was a map of US obesity rates. In 2008 Colorado “weighed” in as the fittest state with an obesity prevalence of 15%-19%. A few days ago, new numbers were announced. In one article, Colorado was called the “skinniest” state with a new rate of 20.7%. I’m proud of Colorado (born and raised here), but calling us the skinniest state with an obesity rate of almost 21% is misleading. Our obesity rate has doubled since 1995. Dr. Hill suggested that Colorado is simply the caboose on a fast moving train going the wrong direction. We’re still the fittest state, but we’re gaining just like everyone else. The highest obesity rates in general are in adults over age 40, ranging from 36% to 42%. That’s a big segment of the population. What do you think? Which is more important in causing weight gain—diet or inactivity? Dr. Hill asked the audience that question and the responses were all over the place. It’s a complex issue and he encouraged lively debate. That’s the mark of a good teacher! Our genes haven’t changed since the 50s and 60s, but our environment has. Our lifestyles are different. We don’t move as much as our parents and grandparents did and we don’t eat the same food they ate. Obesity is the adaptation to this new environment. Our ancestors ate whenever food was available and rested whenever they could. It was a biological necessity. Now, abundant, cheap, and poor-quality food is available at every turn and we don’t even have to get off our bums to prepare it, let alone find or catch it. We can pick up the phone (now conveniently unattached from the wall) and order it to be delivered. If we’re out and about, all we have to do is pull through a drive-up window and have someone toss a bag of food to us. We have to motivate ourselves to move. Now it’s called exercise. It used to be the way we lived. How many motivational sayings do you see posted on Facebook or Twitter each day? I’m “guilty” of that. I post upbeat, motivational ramblings on a regular basis. We sit on our bums in front of our computers and tell each other to get out and do something. It’s actually rather silly when you think about it. As many of you know, I spent the past year co-writing a book with friend, colleague, and endurance athlete Pete Bronski of the blog No Gluten, No Problem. I sat at my computer for long hours, fretted over my writing, stressed about hitting deadlines, and didn’t move as much as I normally do. I’m in that over 40 (way over 40 in my case) category and I gained several pounds. Under 10, but over 6—I’m actually not sure how much weight I gained, but regardless of the amount, “contents did shift” and I don’t like the feeling. It’s easier to gain weight when we’re older because our body composition changes. We typically have less metabolically active muscle tissue because we don’t move as much. I’m on a mission to change that. I started last March. Check metabolism, weight loss, yoga & flexible genes for the back-story. If you diet alone to lose weight, your metabolic rate will go down. That’s not good. Dr. Hill noted that one of the characteristics of people who were successful in losing weight and keeping it off was 60-90 minutes of exercise per day. And if you’re considerably overweight to begin with, you’ll have to work harder to lose the weight because of the metabolic difference between lean muscle and fat. It’s not easy and my heart goes out to people who have this challenge. Just losing my few pounds has been difficult. I can only imagine how overwhelming it would be to have 50, 60, or 100 pounds to lose. But it can be done. It takes lots of time (years maybe); an overall strategy of simple, small changes; a scale (horrors! ); patience; good food; and lots of movement. LOTS of movement. The point is to increase mitochondrial density, which will increase the ability to efficiently process fat. Although the biochemical process is complicated, the point is pretty straightforward. Increase muscle, decrease fat. I’ll leave you with a definition of the mitochondria and we’ll launch into part 2 next week—Pursuing Metabolic Health: What we have Learned from Elite Endurance Athletes with Dr. Iñigo San Millán. Dr. San Millán is the director of the Exercise Physiology and Human Performance Lab at the Anschutz Health and Wellness Center and did a stellar presentation on the importance of movement, mitochondrial density, and fat loss. If you stick with me for part 2, you’ll see that there is always hope. We can make positive changes at any age and the mitochondria is our Starship Enterprise! A double-membraned organelle that plays a central role in the production of ATP (energy-carrying molecule); known as the powerhouse of the cell. Mitochondria are small, spherical, rod-shaped, or filamentous structures that appear throughout the cytoplasm (material within a cell, excluding the nucleus). Mitochondria are self-replicative. Yay! They replicate in response to the increased cellular need for energy. Exercise causes an increase in mitochondria, which is a GOOD thing. We need to do that to lose weight and keep it off. FOREVER. More on that in part 2. Note: For more information on obesity statistics and recipe rehab, check the Anschutz Health and Wellness Center’s Tools & Resources link. If you’re in the Denver area, check their Programs & Services. And if you’re interested in gluten-free living and thriving, check our new book, The Gluten-Free Edge: A Nutrition and Training Guide for Peak Athletic Performance and an Active Gluten-Free Life. Peace, love, and mitochondrial density!